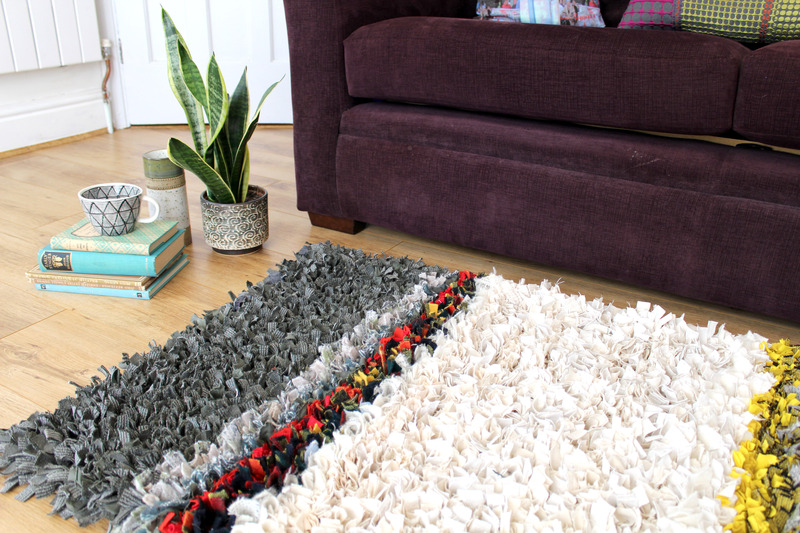 My mum, Victoria, has been on a rag rug marathon recently and has been knocking out one gorgeous handmade rag rug after another – this rug and this rug, for example. Her latest creation, however, began in a slightly unconventional way. Months ago, we were given a piece of hessian that someone had already started to rag rug into. Whoever had begun the rug had shaggy rag rugged about six rows, but things had started to go wrong and they’d decided to cut their losses. Our mystery crafter had rag rugged too close together with a thick fabric into a very very tight weave of hessian. All these factors meant that the hessian had started to curl badly. Here you can see that the hessian was physically curling up from the strain. This sorry piece of hessian had been lying around for a while before my mum got her hands on it. She decided that it would be a shame to let it go to waste and made it her mission to give it a new lease of life. Victoria pulled all the fabric pieces out of the hessian and started afresh. 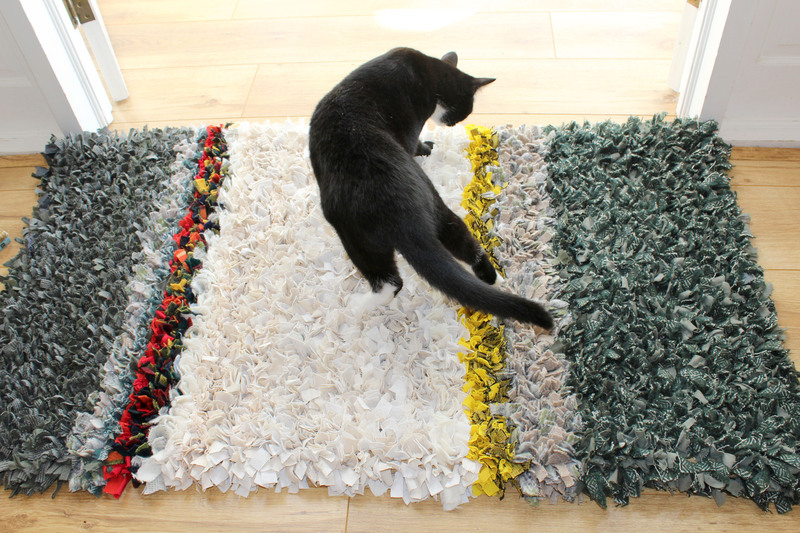 Victoria was determined to use the pre-cut pieces of fabric that were originally in the hessian, so these proved the starting point of the rug. Some of the pieces were a thick woollen fabric (similar to our blanket yarn), which was a lovely quality. 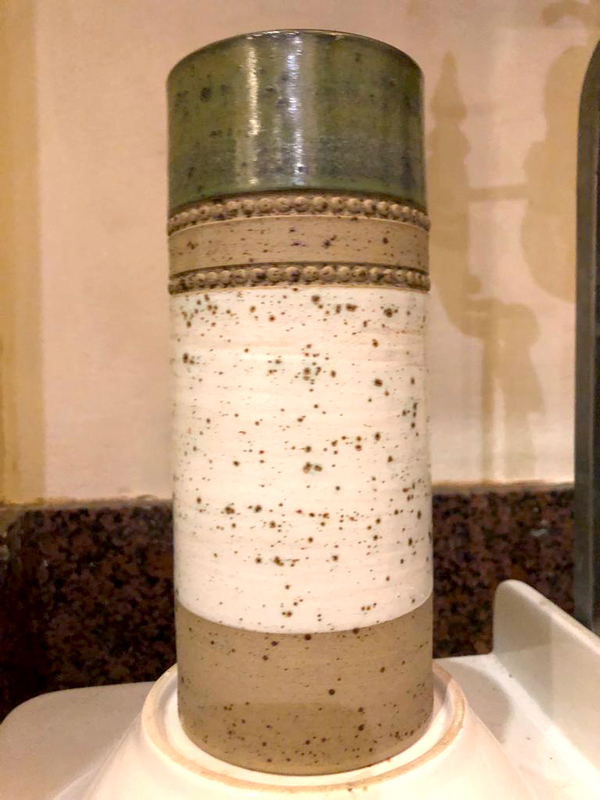 This vase was the inspiration for the rug. The vase gave her the idea for unequal bands of colour with a large neutral section near the centre. After that, it was mostly improv as per Victoria’s usual rugs. 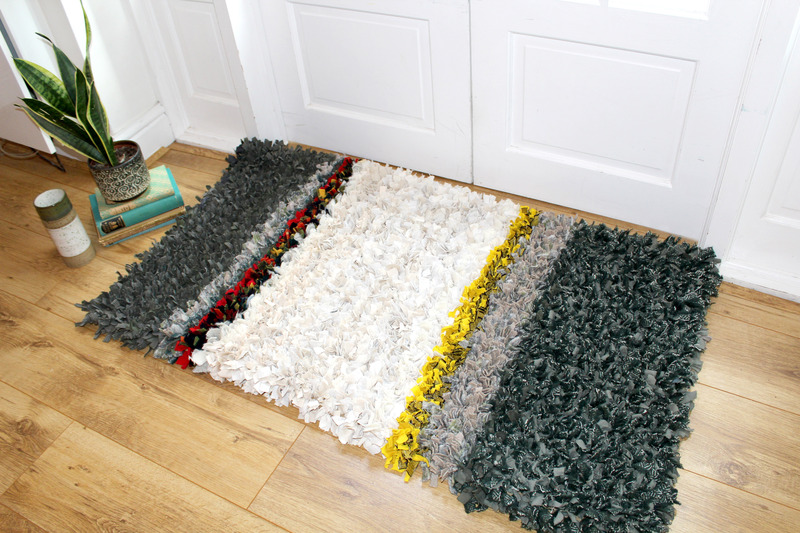 So, that’s the story behind the rag rug, but I bet you’re mostly keen to just see what it looks like, so here it is… Ta da! Ta da! 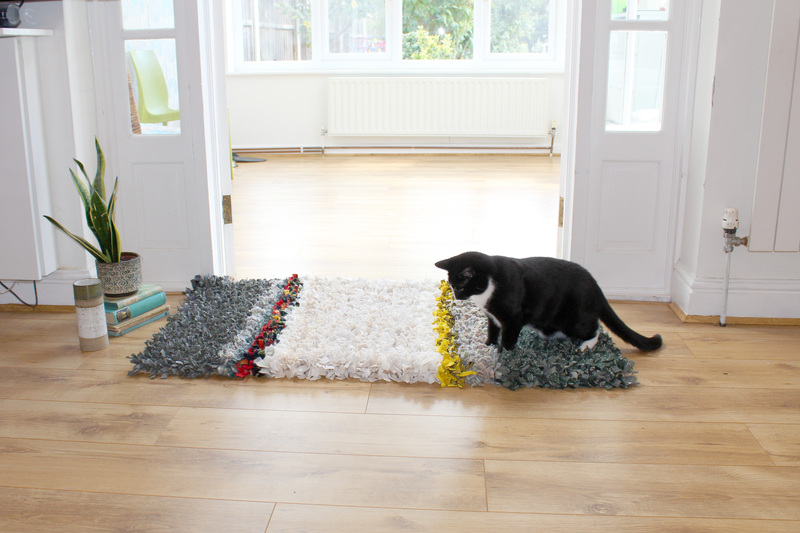 My mum’s handmade rag rug. 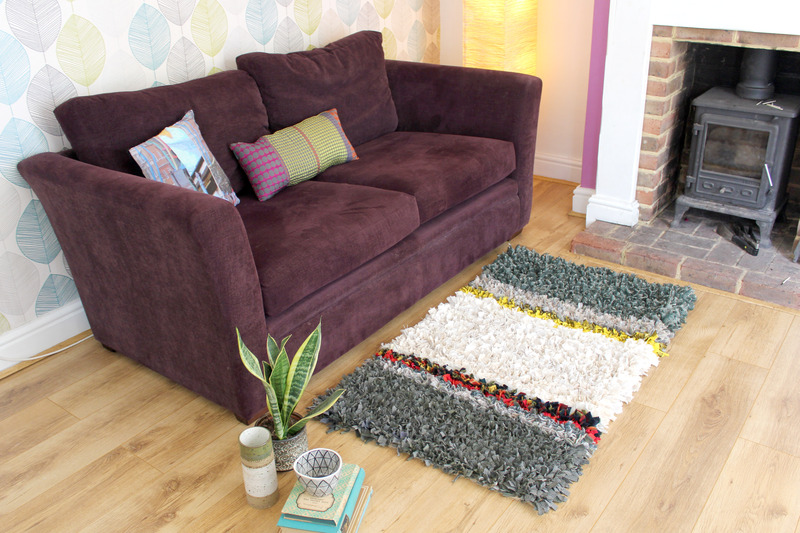 I think the coloured stripes in the rug really help to lift the design – it almost feels Bauhaus. 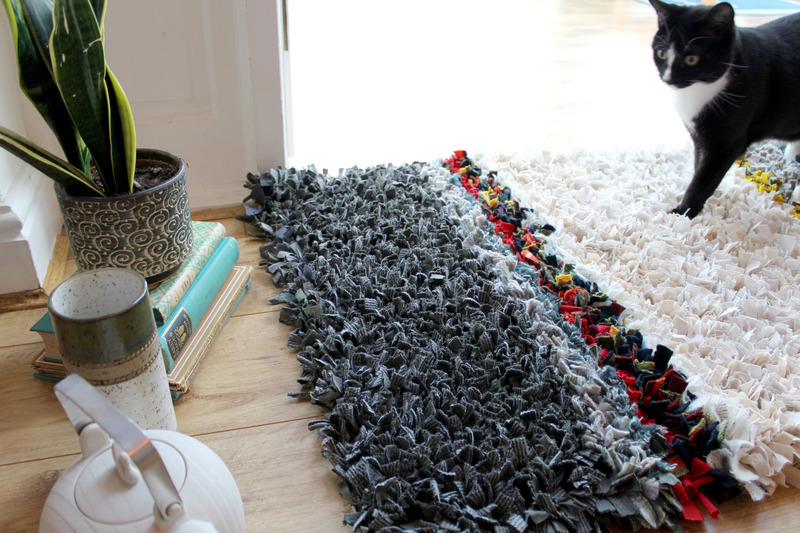 The largest green section of the rag rug incorporated the fabric that had already been cut and put into the hessian. The rug wasn’t a literal translation of the vase, but you can see the influence. Hughey the cat making a guest appearance. Hughey isn’t sure what to make of the rug at first. 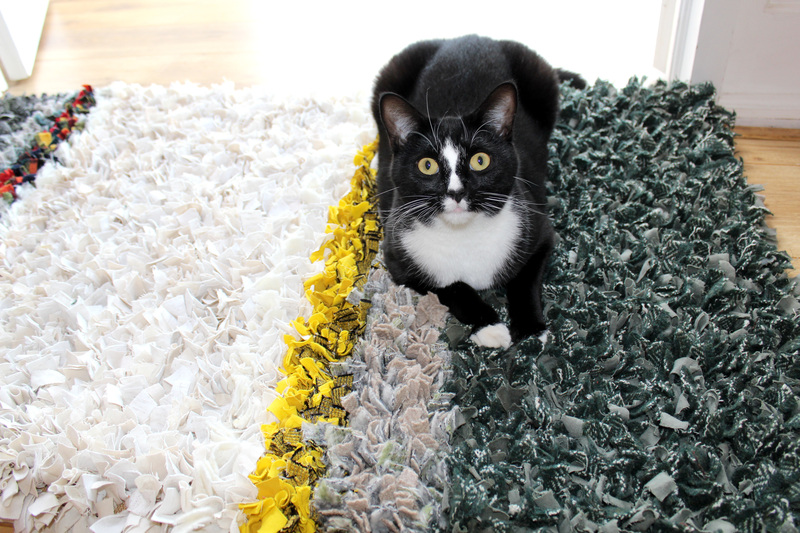 There’s something that attracts animals to rag rugs – I think it may be something to do with the texture and smell of the hessian that they like. Has anyone else noticed that? 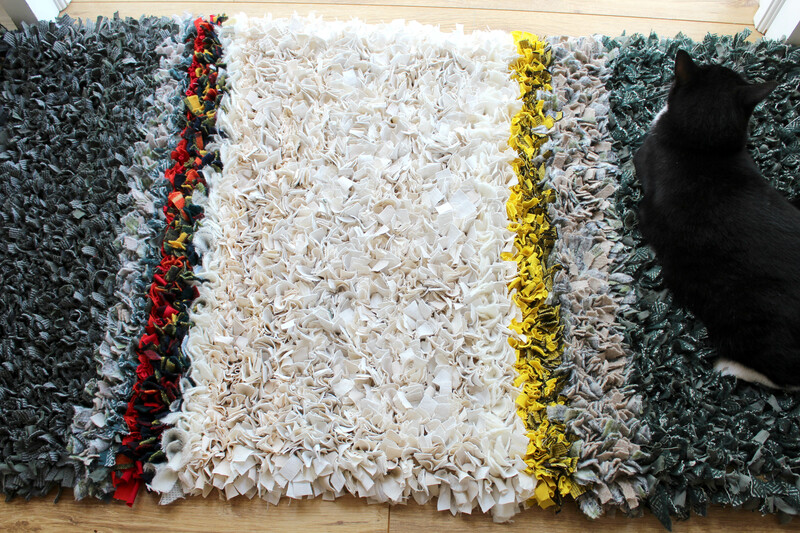 Well, that was the my mum’s latest handmade rag rug in all it’s beautiful and shaggy glory. I hope you liked seeing how it turned out (particularly given its inauspicious start). 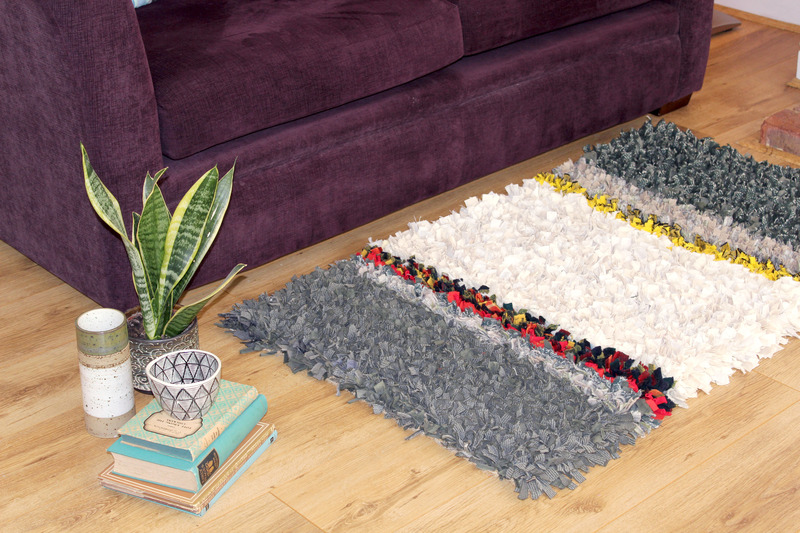 If you’d like to be the first to see my latest projects, why not join our Rag Rug Community on Facebook https://www.facebook.com/groups/RagRugCommunity/or join our fortnightly newsletter here. 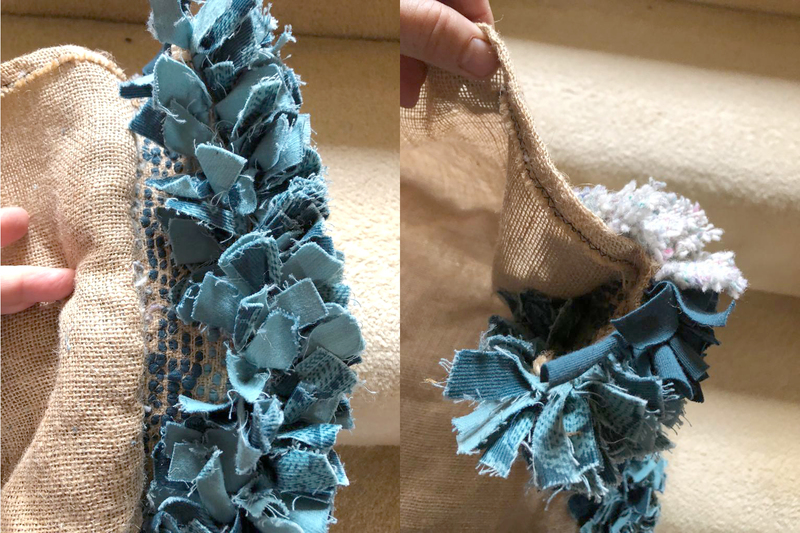 This entry was posted in Rag Rug Designs, Rag Rugs and tagged 2018, Shaggy, Shaggy Rag Rug, Striped Rag Rugs. Bookmark the permalink.